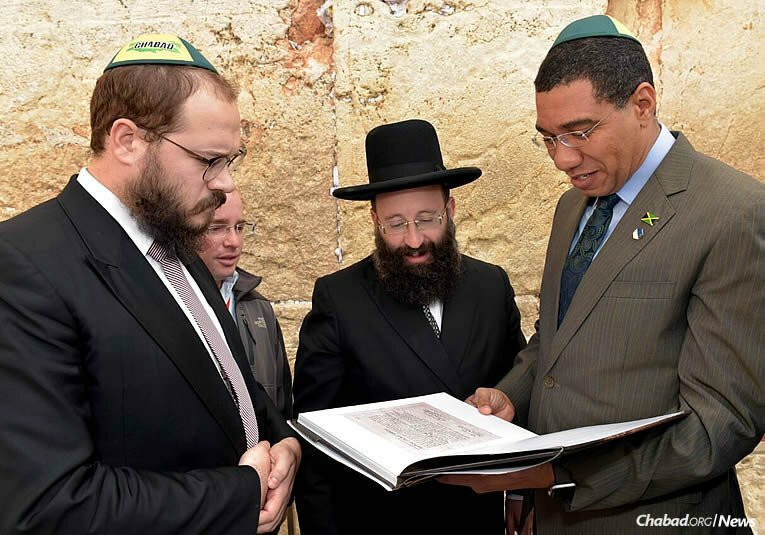 Prime Minister of Jamaica Andrew Holness, right, visited Israel to discuss mutual concerns with Prime Minister Benjamin Netanyahu. 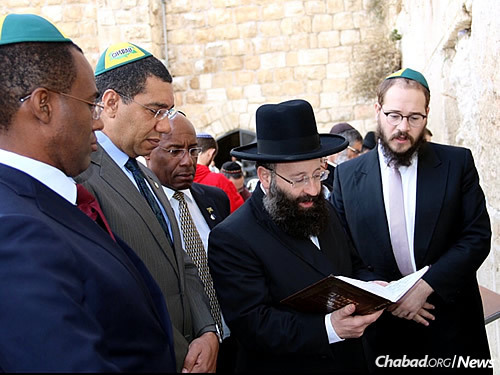 Here, he is accompanied to the Western Wall (Kotel) in Jerusalem by Rabbi Yaakov Raskin, left, co-director of Chabad of Jamaica. In the center is Rabbi Shmuel Rabinowitz, rabbi of the Western Wall. 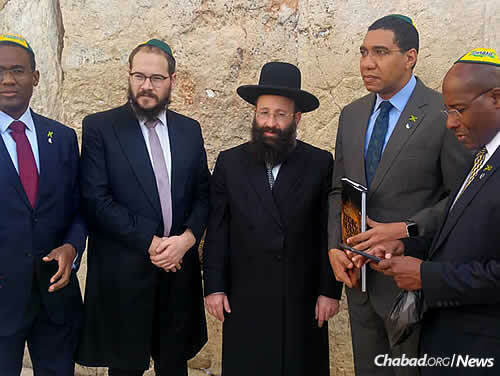 Prime Minister of Jamaica Andrew Holness has been in Israel for the past few days, meeting with Israeli Prime Minister Benjamin Netanyahu and other government officials to discuss possibilities for cooperation in such issues as water, agriculture and domestic security. Rabbi Yaakov Raskin, co-director of Chabad of Jamaica with his wife, Mushkee, is in Israel as well. 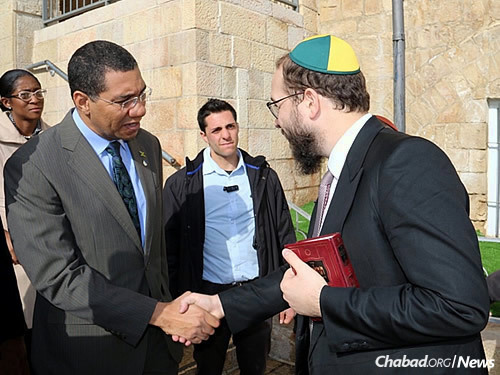 On Friday, he accompanied Holness, 44, to Jerusalem’s Old City and the Western Wall (Kotel). It is the Jamaican prime minister’s first visit to Israel. “The Jamaican people and the Caribbean region is a zone of peace, and we wish peace for all the peoples of the world,” said Holness. “And we do extend our sympathies to the people of Israel for the very unfortunate attack on your soldiers recently. Chabad’s presence in Jamaica has a long and storied history, dating back to the summer of 1957, when young rabbinical students Yehuda Krinsky and Leibel Raskin had been sent by the Rebbe—Rabbi Menachem M. Schneerson, of righteous memory—to bring Jewish publications and awareness to Caribbean islands. Over the decades, Jamaica was served by successive groups of “Roving Rabbis” who visited the island, mostly during the summer months or for Jewish holidays. A permanent Chabad House was established in the fall of 2014. It was the Jamaican prime minister’s first visit to Israel.